Interested in saving 50% on groceries? Try out FARE for All (Food and Resource Exchange)! Through FARE for All you can almost double your food dollar, freeing up money for other things. FARE for All is a nonprofit food buying program that allows people to increase their food purchasing power. It works because food is purchased by the truckload and the savings are passed on to you. Each month individuals pay $17 per package and receive up to $40 worth of fresh quality food items including fruits, vegetables and frozen meats. The best news is FARE for All is open to everyone, regardless of income. The more people who participate the better—because it adds to the program’s food buying power. FARE for All accepts cash, credit and debit cards and food stamps. No reservation is necessary. So, stop by the next Food for All distribution on Tuesday, February 2, 4-6 p.m. at Lenox Community Center, 6715 Minnetonka Blvd. Visit STEP‘s website to find out more about FARE for All and future distribution events. 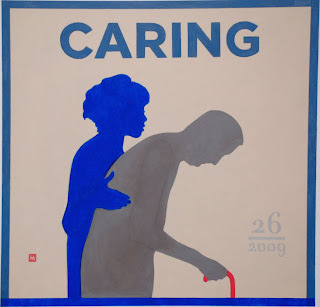 Mark Hiltner, Nordicware, created the painting above about Asset #26 – Caring. ← Happy Holidays Asset Champions!